Leading clinical discovery is about improving care for as many patients as possible, which is exactly what NM/CT 870 DR was designed to do. It’s a premium SPECT/CT system with the added flexibility of a standalone CT that includes the latest advancements in dose and metal artifact reduction technology. It delivers the accurate, reproducible results referring physicians require in a comfortable and streamlined exam experience, so you can lead clinical discovery with hybrid imaging. All our new 800 Series SPECT/CT systems build on the success of the 600 Series with a collection of SPECT technology enhancements that add to the value of nuclear medicine. 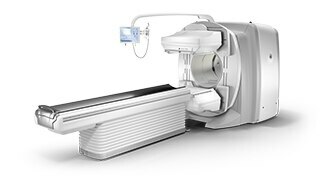 In addition to the all-new SmartConsole, these enhancements include a new LEHRS (Low Energy High Resolution and Sensitivity) collimator, which can be combined with either SPECT Step & Shoot Continuous scanning mode or our Planar Clarity 2D processing to increase sensitivity and enable a reduction of scan times or injected dose1. It’s called SwiftScan Planar and SwiftScan SPECT. 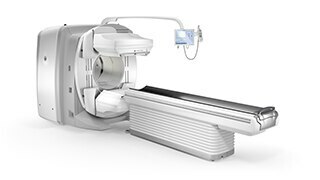 NM/CT 870 DR includes our Elite NXT NM detectors, designed to address some of nuclear medicine’s biggest challenges. 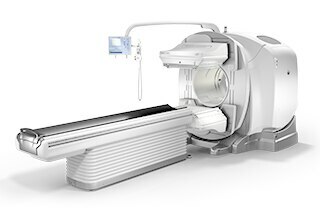 It also includes a 16-slice CT system with IQ Enhancement technology that enables helical coverage speed equivalent to that of a CT scanner at the same table speed2 with a 50-slice wider detector. Not only does this CT technology add clinical value to SPECT images, it can function as an additional standalone CT. These improvements to both SPECT and CT technology are the foundation for quantitative results. Results that are made even more valuable with the advanced applications included with the Xeleris™ workstation and the new SmartConsole. Our vision for the future of molecular imaging is a completely digital experience. It’s a vision that encompasses technology, data collection and connectivity, processing software and the suite of applications you use to interpret and communicate information. Together, these fully digital components will provide the best possible insights to guide not just your clinical outcomes, but your financial and operational outcomes as well. NM/CT 870 DR, working alongside our Xeleris workstation, delivers on this vision with a platform that’s ready today to leverage software innovation capable of collecting data and developing new insights with quantitative analytics. And its modular design makes transitioning to digital detection as simple as exchanging the detector technology. Introducing SmartConsole. It’s an all-new productivity hub for hybrid imaging. By automating SPECT/CT reconstruction, SmartConsole simplifies the workflow for complex hybrid and quantitative protocols and allows technologists to review results directly at the scanner console. It also allows physicians to review scans remotely from their own mobile devices. They can modify processing settings and initiate study processing anytime, anywhere across a LAN or a WAN*. That means better collaboration during scans and better accessibility for reviewing scans once complete. *Minimum hardware and software requirements apply. SmartConsole makes advanced procedures more accessible by transferring exams directly to the PACS or other pre-defined DICOM destinations with no operator intervention. Now, you can generate and send an additional dataset in PET DICOM format to enable quantitative SPECT results and SPECT SUV (Standard Uptake Value) on any PET DICOM compliant workstation or PACS. As a result, referring physicians can review and evaluate your SPECT/CT exams with the same quality of information they have come to expect from your PET/CT, as supplemental information to the original SPECT/CT images. All of which is part of our ongoing vision to grow and strengthen the role of nuclear medicine. NM/CT 870 DR is ready, because of its modular design, for already-available direct-conversion digital detector technology. What’s more, you have the option to purchase SPECT advancements like SwiftScan Planar and SwiftScan SPECT now, or in the future. The same goes for your CT with the ability to add features like ASiR™ at a later date, when it best suits your practical application. This allows you to acquire the system that fits your needs today knowing that we can help you easily and cost-effectively upgrade your capital investment if your practice requires it. NM/CT 870 DR was designed to help you spend more time with your patients. An ergonomic cart streamlines collimator exchanges between exams. Scan ranges are easy to set with an interactive bedside ruler and positioning lights. And the Ignite user interface allows you to pre-program three-step protocols, so you can select the patient, study and image processing in a matter of seconds. Additionally, SmartConsole allows automated SPECT and SPECT/CT processing for physicians to review scans and define parameters remotely from their mobile devices, instead of having to go to a dedicated workstation. The time saved with this simple change helps make it possible to complete exams in predictable time slots. Evolution technology changes the relationship between dose, image quality and time by applying a resolution recovery algorithm that models the collimator-detector response. The result permits up to half the scan time or up to half the dose while delivering the same image quality as from a full-time or full-dose scan3. In addition, you have the option to further reduce dose or scan times by enabling SPECT data acquisition while the detectors are in motion with SwiftScan SPECT1. Conventional CT image reconstruction techniques are simple and fast, but they are limited by their sensitivity to noise and artifacts. ASiR extracts noise by modeling its root causes for each patient and application type. This technique may allow for reduced mA in the acquisition of diagnostic images and as a result, reduce the dose required5. 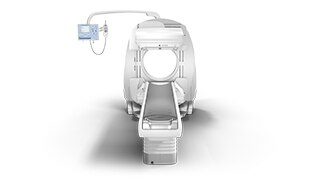 NM/CT 870 DR also comes with Volumetric Image Space Reconstruction (VISR)*, which provides clear visualization in neuro imaging to deliver diagnostic image quality with potentially lower mA5. *When ASiR is installed, VISR will be disabled. To lead clinical discovery with hybrid imaging, you need quantitation. It’s what makes it possible to not only find disease, but to follow its response to treatment over time. It helped establish PET/CT as a valuable clinical tool. Now, with recent advancements to technology, consistent and accurate quantitation is possible with SPECT/CT. NM/CT 870 DR is a SPECT/CT built for consistent, reproducible quantitation. Improvements to detector performance enable exceptional spatial resolution for SPECT and planar images. It also leverages CT-based attenuation and scatter correction along with Evolution4 image reconstruction. In addition, ever-increasing computational power enables precise camera calibration for less variation between exams. Once your quantitative studies are acquired, the new SmartConsole, together with Xeleris, makes it easier to access them. With SmartConsole, your quantitative SPECT/CT studies are automatically transferred directly to the PACS or other pre-defined DICOM destinations. Furthermore, an additional dataset in PET DICOM format allows you to review and evaluate images on the same devices you use to view your PET/CT studies, as adjacent information to the original SPECT/CT images. The Xeleris workstation is our Nuclear Medicine, PET, NM/CT and PET/CT processing, analysis and review system. It’s designed to leverage the latest in SPECT quantitative applications for routine clinical use, accelerate workflow and improve diagnostic confidence. It also opens the door to the new era of digital healthcare delivery through its potential to access the GE Health Cloud and with advanced applications to help solve some of the most complex clinical presentations. Molecular imaging is more than a tool for seeing within the human body. It allows the search for something greater, the search for a deeply hidden truth known as a true discovery. It’s the kind of discovery that is reproducible evidence of what is seen and often not seen. This is the kind of discovery you are after every day for every patient. In molecular imaging, every patient is an opportunity to make the true discovery that will change their life for the better. It’s an opportunity you take seriously as you work hard every day to influence the lives of as many individuals as possible. Our mission is to help you in yours. We partnered with leaders in healthcare like you to understand what you need from your instruments. NM/CT 870 DR is our answer. More than a new imaging product, it’s a system for those dedicated to leading clinical discovery with hybrid imaging. 1 Compared to LEHR collimator, with Step & Shoot scan mode (for SPECT) / without Clarity 2D (for Planar). As demonstrated in phantom testing using a bone scan protocol, Evolution processing (for SPECT), and a model observer. Because model observer results may not always match those from a human reader, the actual time/dose reduction depends on the clinical task, patient size, anatomical location and clinical practice. A radiologist should determine the appropriate scan time/ dose for the particular clinical task. 2 Image quality as defined by an Artifact Index in Phantom testing. Data on file. 3 As demonstrated in phantom testing using a model observer. For SPECT, compared to using the LEHR Collimator and a SPECT Step & Shoot acquisition. For Planar, compared to using LEHR without Clarity 2D. 4 In clinical practice, Evolution options4a (Evolution for Bone, Evolution for Cardiac, Evolution for Bone Planar) and Evolution Toolkit4b are recommended for use following consultation of a Nuclear Medicine physician, physicist and/or application specialist to determine the appropriate dose or scan time reduction to obtain diagnostic image quality for a particular clinical task, depending on the protocol adopted by the clinical site. 4a Evolution Options - Evolution claims are supported by simulation of count statistics using default factory protocols and imaging of 99mTc based radiotracers with LEHR collimator on anthropomorphic phantom or realistic NCAT – SIMSET phantom followed by quantitative and qualitative images comparison. 4b Evolution Toolkit - Evolution Toolkit claims are supported by simulation of full count statistics using lesion simulation phantom images based on various radiotracers and collimators and by showing that SPECT image quality reconstructed with Evolution Toolkit provide equivalent clinical information but have better signal-to-noise, contrast, and lesion resolution compared to the images reconstructed with FBP / OSEM. 5 In clinical practice, the use of ASiR or VISR may reduce CT patient dose depending on the clinical task, patient size, anatomical location and clinical practice. A consultation with a radiologist and a physicist should be made to determine the appropriate dose to obtain diagnostic image quality for the particular clinical task. 6 Quantitative accuracy defined as equivalence to well counter-measured injected activity in a test phantom. Equivalence means <11% difference when comparing measured counts in SPECT studies corrected by Q.AC-reconstructed CTAC to measured counts in studies corrected by benchmark reconstructed CTAC. Measured counts are defined as average within identical ROIs positioned on SPECT reconstructed slices of homogenous 99mTc solution phantom study.